Jared Latane, center, became Haddon Heights all-time leading scorer during his team’s 80-78, overtime victory over Pleasantville in the first round of South Jersey 2 tournament in boys’ basketball on Tuesday. Maybe the best thing Jared Latane did on Tuesday night was keep his cool. Which is saying something, considering the rest of his performance in a pulse-pounding playoff opener. Jared Latane, left, became Haddon Heights all-time leading scorer during his teamÕs 80-78, overtime victory over Pleasantville in the first round of South Jersey 2 tournament in boys’ basketball on Feb. 27, 2018. He scores against Shawn Vaughan in the 4th quarter. He generated 37 points. He became Haddon Heights' all-time leading scorer. He registered six of his team's seven points in overtime. And he led Haddon Heights to an 80-78 victory over Pleasantville in a bullet train of a South Jersey Group 2 tournament game before a thoroughly entertained crowd in the Garnets' gym. 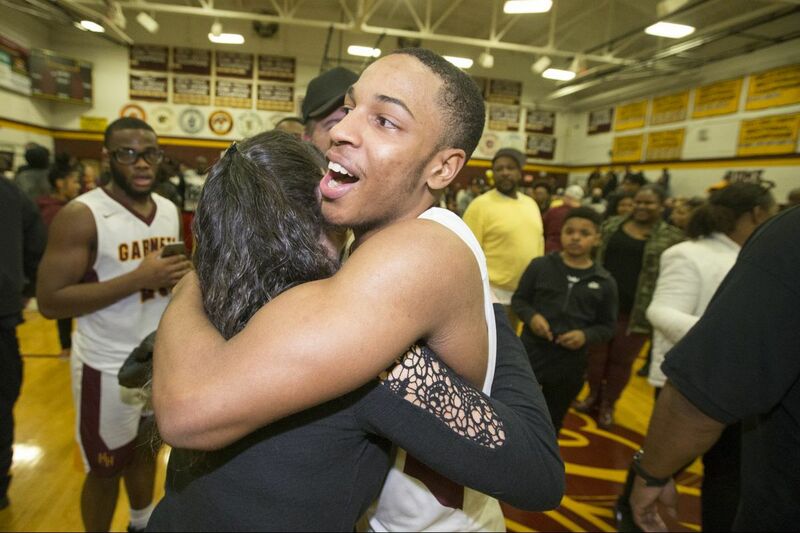 "We had the best player on the floor," Haddon Heights coach Mike Ricci said. "That was Jared." Sophomore Te'Sean Pressley added 23 points and freshman Isaiah Turner blocked six shots and made three key free throws late in the game for seventh-seeded Haddon Heights (23-4), which advanced to face archrival and second-seeded Haddonfield in Thursday night's quarterfinals. Senior Divine Anderson scored 25 and junior Sahmir Jones added 18 – including a floater that forced overtime – for 10th-seeded Pleasantville (16-10). "Our kids never quit," Pleasantville coach Butch Warner said. "We fought to the end. The ball just bounced their way in the second half." For all of Latane's heroics, his most important contribution to the cause might have been his ability to stay calm when Pleasantville seized command at the start of the game. The Greyhounds used their athleticism to dominate play, building leads of 15-2, 19-4 and 21-4. But Latane kept urging his teammate to stay positive, keep their poise and maintain patience. He was confident the tide would turn. "Panicking only leads to more bad things," Latane said. Gradually, the Garnets worked back into contention, as Latane kept hitting three-pointers despite tight defense by Pleasantville. "He doesn't need much room," Warner said. "He's flashy and he's a scorer." Latane's second three-pointer of the game broke Doug Miller's school record of 1,815 career points, set in 1971. "It was a relief," Latane said. "They stopped the game and I wanted to get back to playing." Despite pressure from rotating defenders, Latane kept scoring. He also made his free throws, going 8-for-9 and making two for a 79-75 lead at the 0:16 mark of overtime. "I've coached a lot of great players but he's the best leader I've ever been around," Ricci said. "Every timeout, every halftime, he's nothing but positive, talking to the younger guys. He instills confidence." P: Divine Anderson 25, Sahmir Jones 18, Jacob Valeus 16, Mohammed Toure 6, Sam Growatt 3, Shawn Vaughn 10. HH: Jared Latane 37, Jabari Higgs 8, Te'Sean Pressley 23, Jake Campbell 3, Jared Bolling 2, Isaiah Turner 7. Jared Latane, center, became Haddon Heights all-time leading scorer during his teamÕs 80-78, overtime victory over Pleasantville in the first round of South Jersey 2 tournament in boys’ basketball on Feb. 27, 2018. He poses with family members after the game.